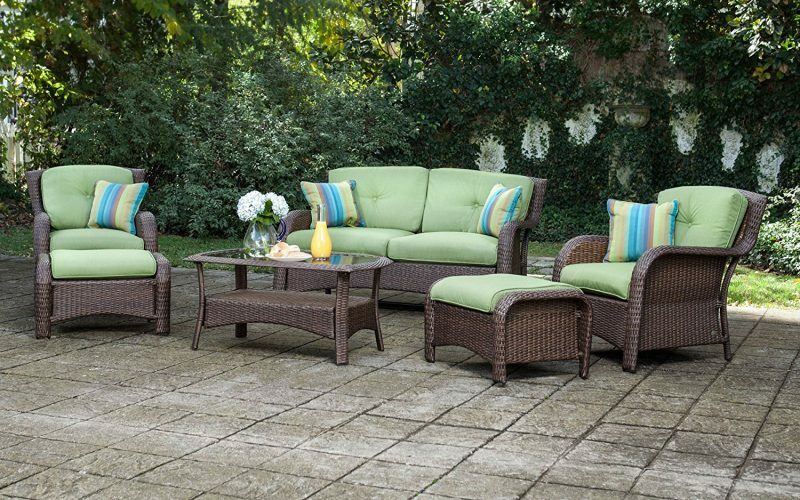 When you have a patio at your place, you wouldn’t want to miss a chance to relax there after a tiring day. 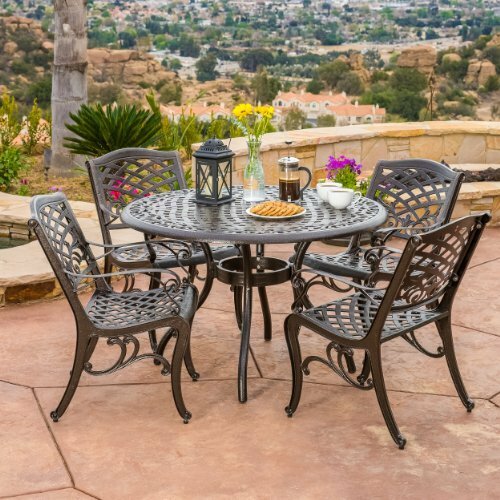 Whether it’s you sipping your cup of coffee all alone or having an amazing family time, your patio could be that sweet spot of your home. To make it worth spending a good time at, you can equip your patio with great furniture and make it a cozy and comfy place. The internet is flooded with so many products, it’s mind boggling to figure out what might be the best sort of furniture for your patio. 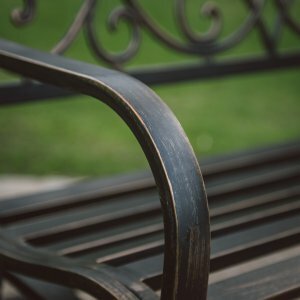 So, to help you know better, here’s a list of a variety of material used in making patio furniture. 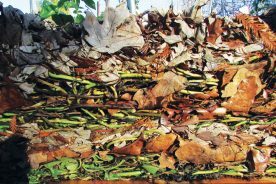 This will help you identify what kind of material would last longer in your patio based on weather conditions and surroundings. Furthermore, there’s also a list of products that are touted as some of the best ones. 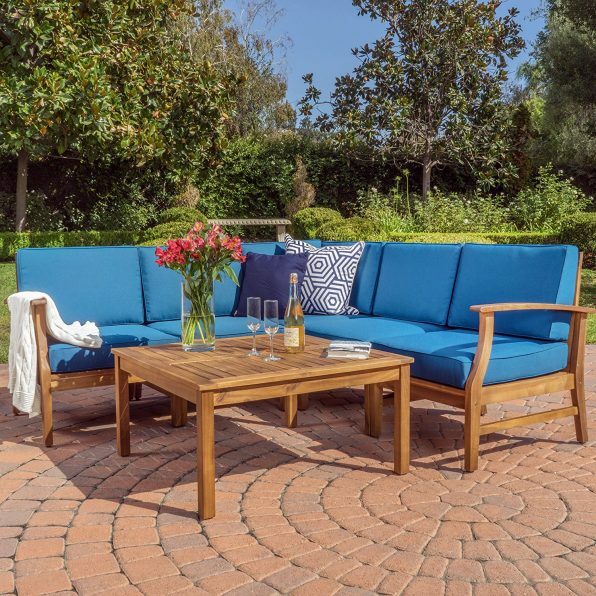 This article will help you know how to invest in the most useful patio furniture without having to do much research on it. The reason for knowing different types of patio furniture is important because every place has its own climate and weather conditions. You wouldn’t want to buy furniture that doesn’t suit your place. Also, before you buy your patio furniture, test the comfort and sit on it before you reach for your wallet. Good patio furniture is definitely about looks, but that’s not all. You have to make sure it’s worth sitting on every day, and if not every day- at least on a regular basis. Four materials have been described below. Each one of them has its own advantages, disadvantages, durability, and cost efficiency. You can weigh all the conditions and find out what’s best for your beloved patio. 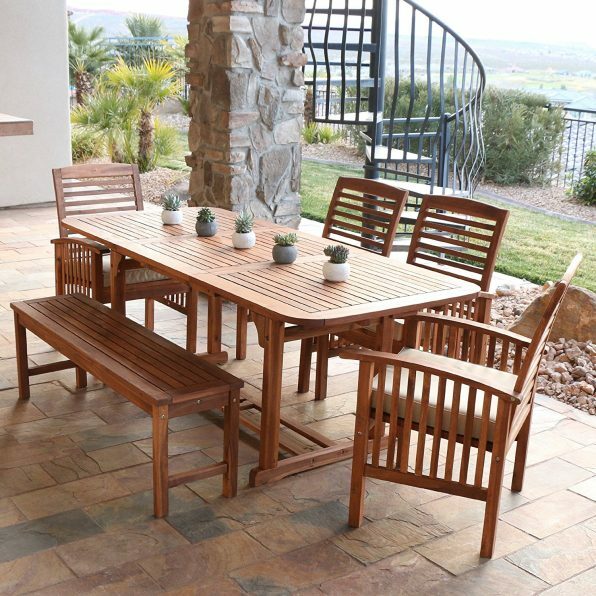 When we talk about patio furniture, most people like to keep it natural by selecting wooden furniture. Looks-wise, it does all justice to a patio. The best thing about wood furniture is they are strong, heavy, and do not absorb heat. But, because wood is basic and natural material, you sign up for heavy maintenance if you buy wood furniture. If you take good care of the furniture, it proves to be greatly durable. Hardwoods, like jarrah, teak, and shorea last up to about 50 years. Redwood and roble last half that time (25 years) which isn’t bad either. 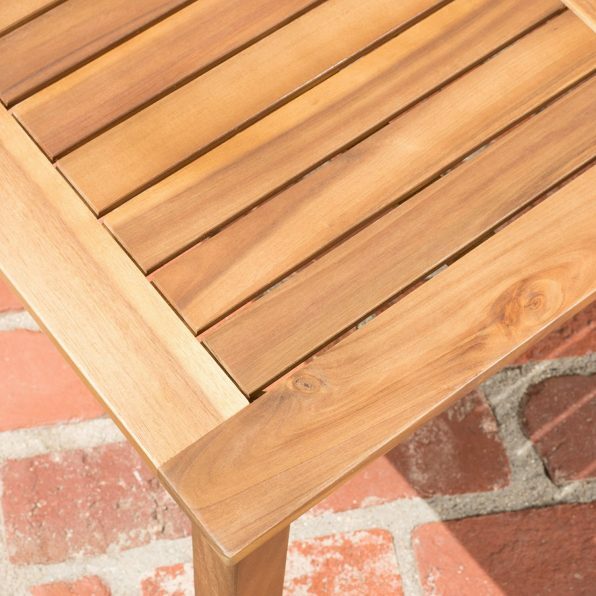 If you protect your wood furniture with oil coatings and UV filter paints, the furniture last a lot longer. 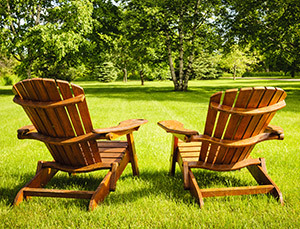 Given all the benefits of having wood furniture in your patio, you need to remember wood furniture is more expensive as compared to other types. Wicker furniture gives your patio a rustic look. 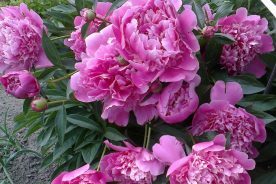 It can be either natural or synthetic. Wicker furniture is generally made out of rattan, cane, bamboo, or some other material. 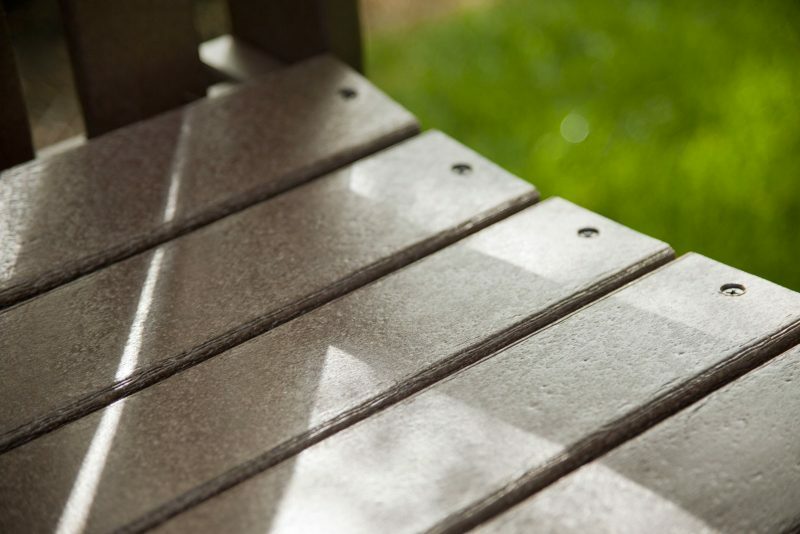 If it is made of synthetic material, it is most appropriate to be used as patio furniture as it increases the durability and weather resistance. Moreover, if you plan to keep it cheap, synthetics ones cost low. The benefits of having a wicker furniture in your patio is that it’s really light and flexible, which means you can keep changing its place effortlessly (if you like changing the setting). These are washable and you can sue a mild detergent to wash them. Since you would need cushions for them, buy the ones that are weather resistant and don’t fade. If you are looking for the cheapest of all furniture, you can totally go for plastic furniture. This is cheap, incredibly light, and chairs are stackable for storage. The disadvantage is that it is cheap but not durable. Also, being light, they are not sturdy. While you can clean them with soapy water, you will want to increase their durability by constantly storing them and saving them from fading. Resin furniture is durable as compared to plastic. It is moisture, mildew, and stain resistant. 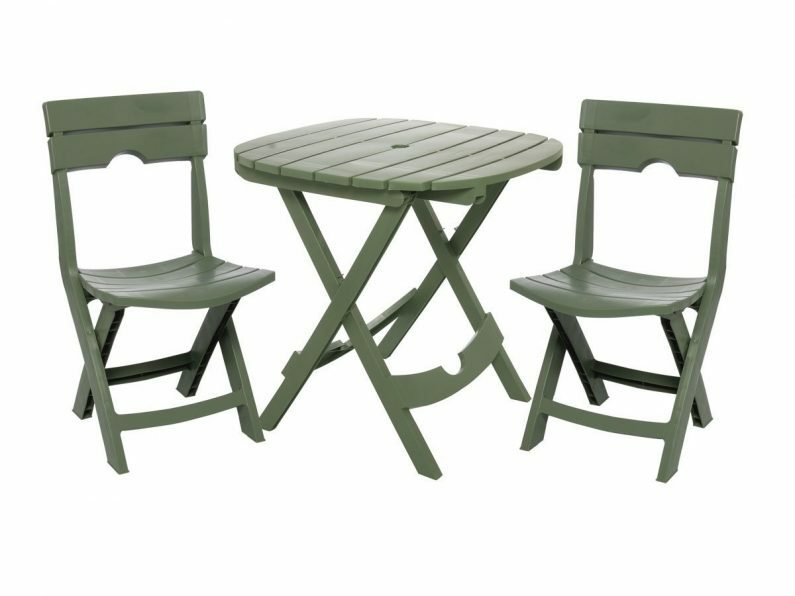 Obviously for the lightweight, these are not as wind resistant as other furniture. But they are water resistant. So, if it rains too much in your place and you constantly have to keep storing your furniture, or just expose it to rains, you can buy plastic or resin furniture. Resin furniture is costlier than plastic ones. Metal furniture is another alternative if you want sturdy and durable furniture. First up, talking about wrought iron furniture, these are available in both traditional and contemporary styles. They give a formal look to your patio. If you live in windy place, these are best since they are very heavy. But in the sun, wrought iron gets really hot and isn’t suitable for sitting. And in cold days, it becomes too cold. So, you need cushions to be able to sit on it. While rusting is a big trouble, if taken proper care and saved from corrosion, they can last quite long. The newer concept is to let a patina of rust remain. The reason why this trending is because once a layer of rust forms, it is right there forever. And this layer could protect the rest of the metal while looking all ancient and different from normal. To get rid of all the disadvantages of wrought iron, you can buy aluminum furniture. These are resistant to rusting, heating up, and are light and easy to move. But these might cost more as compared to wrought iron furniture. 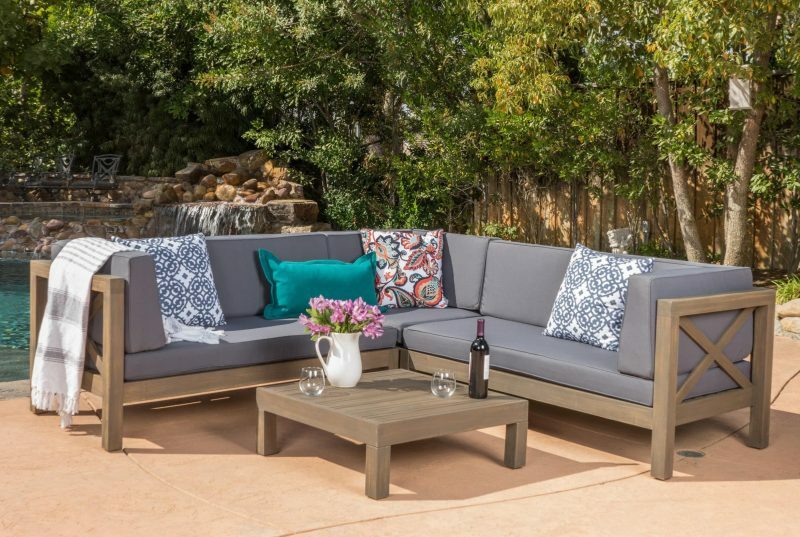 The cushions of this furniture are water resistant, which means they are ideal to be placed in your patio. You can keep changing the arrangements to come up with your comfortable shape of seating. The furniture needs assembly of parts. The cushion covers are removable. The available colors are blue and green. Size: Corner chair seat- 14.5” H x 28” W x 28” D, Corner chair overall- 26.5” H x 30.25” W x 30.25” D, Left and Right corner bench – Arm height: 26.5”, Right and Left Corner Bench seat: 14.25” H x 56” W x 28” D, Right and Left Corner Bench overall: 26.5” H x 58.25” W x 30.25” D.
This patio furniture set is sturdy and brings life to the patio because of its colors. It is available in blue, white, and beige color. The hands of the sofas have an x-design. The cushion is made of water resistant fabric and is also easy to clean. The design is contemporary and assembly is required. Included pieces: Four chairs, one extendable table, one bench, cushions. Size: Table Dimensions: 55.75” W x 35” D x 30” H; Weight: 85 lbs. Bench Dimensions: 53” W x 14” D x 18” H; Weight: 18 lbs. Single Chair Dimensions: 24” W x 28” D x 35” H; Weight: 24 lbs. If you have many members in family, or people keep visiting you, this one provides enough seating space. The table is extendable. It is more of a dining set and for people who are looking for absolute comfort, it wouldn’t be able to fulfil that purpose to the fullest. It is quite resistant to outdoor elements. The furniture, however, should not be exposed to freezing temperatures. Assembly for the furniture is required. 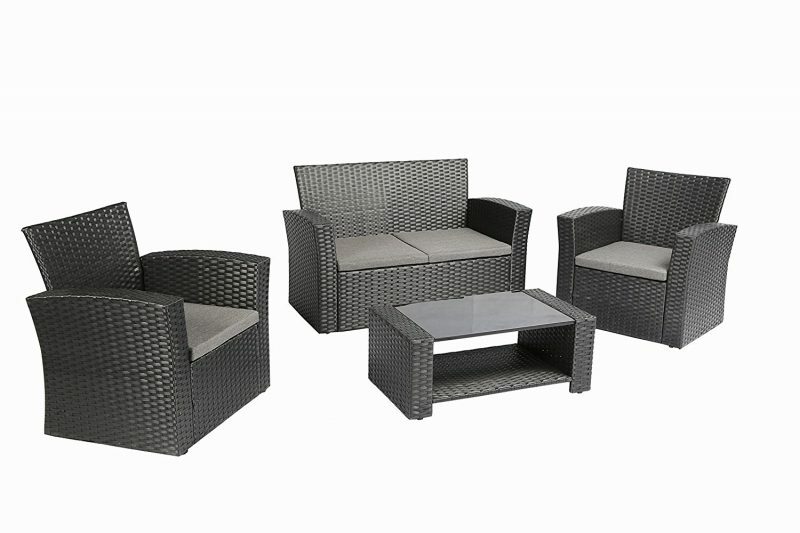 This patio furniture is made of weather resistant wicker and has a powder coated steel frame. The wicker is all-weather, mildew resistant. 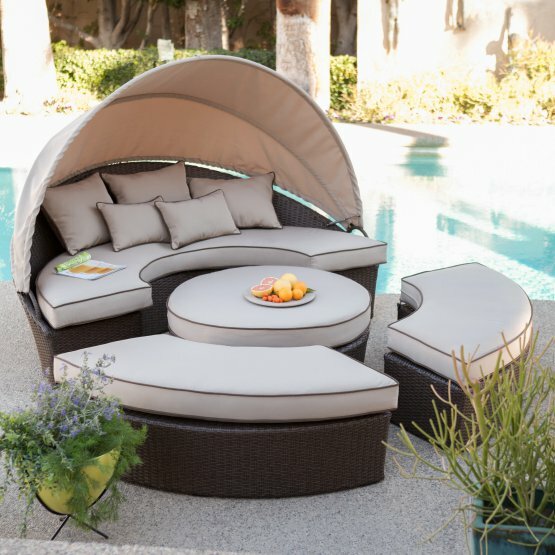 The covers of the cushions are removable and the cushions are resistant to all-weathers and UV rays. This furniture can accommodate four people. You can clean the furniture using a dry cloth. Assembly of the furniture is required. Included pieces: Two curved benches, Loveseat with canopy, seat cushions, ottoman, ottoman cushion, 5 pillows. Color: Khaki with chocolate welt, sea blue with white welt, terracotta Olefin. Size: Loveseat: 80” L x 44” W x 58”, weight: 50 lbs. ; Bench: 55” L x 25” D x 12.5” H, weight: 18 lbs. ; Ottoman/coffee table: 37.5” diam. x 12.5” H, weight: 26 lbs. All pieces together as a chaise lounge: 80” L x 80” D x 12.5” H. Toss pillows: 3 – 22” x 18” and 2 – 18” x 12”. 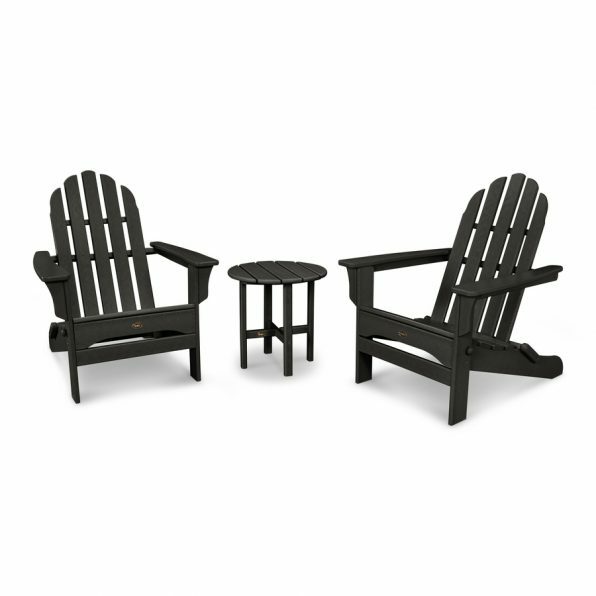 This patio furniture set is made of all-weather resin wicker, and has a powder-coated aluminum frame. You can combine pieces of the furniture to adjust it for sitting or lying down on. You can accommodate about six to eight people in sitting. If it’s too sunny, you can use the canopy to cover yourself for shade. The furniture has olefin fabric– it is resistant to water, fading, odor, bacteria, and mold. Included pieces: Four sectional chairs, one glass table, one ottoman, two pillows, four back cushions, five seat cushions. 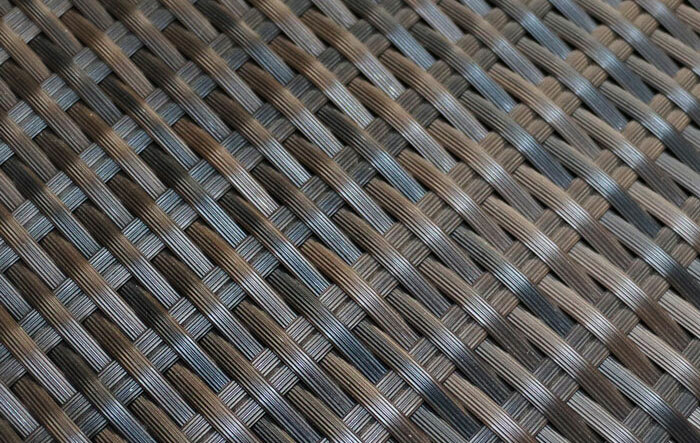 Color: Black rattan, khaki cushions. You have to assemble all the parts of the furniture, but the assembly is said to be easy. The cushions are easy to wash and you can remove their covers. But, note that the cushions are not weather resistant. When it is rainy, it is better to store them away from rains. The steel frames used in the making are rust resistant. Color: Black, brown, grey, green, tan, white. 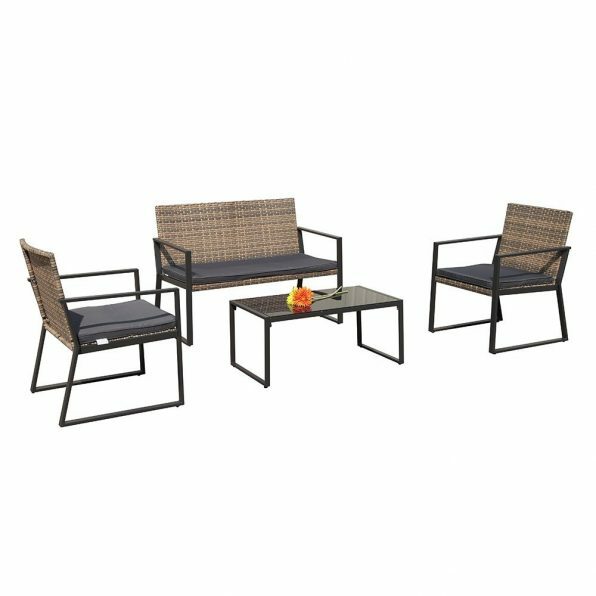 If you are looking for patio furniture that’s both cheap and meant just for two, you can buy this one. 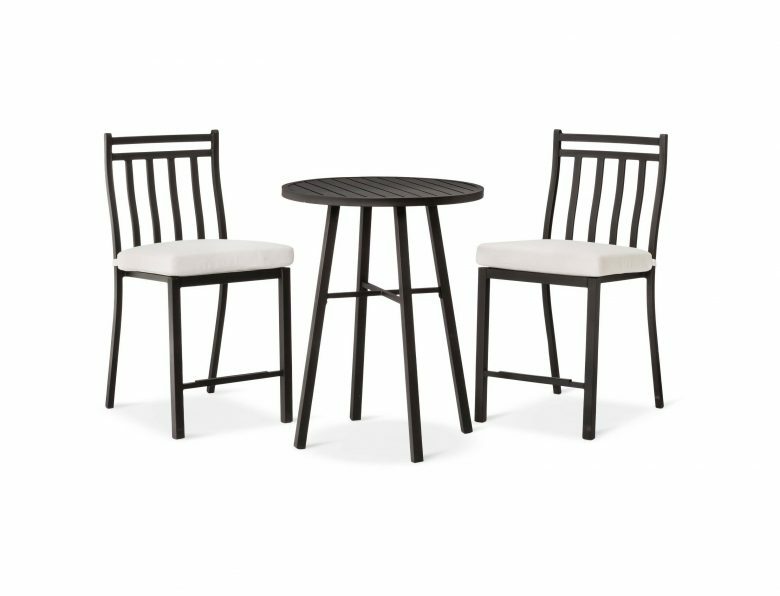 The chairs are foldable and the side table is round. The furniture is resistant to stains left by foods and beverages. It is made from recycled materials, and can withstand extreme weather conditions. It is traditional in style and doesn’t come with cushions. This is one of the cheapest option for a patio furniture. These chairs are foldable and are lightweight. The table of the set has an umbrella hole that can fit almost all types of umbrellas since the hole size is standard. It is good enough to accommodate two people and the table can accommodate food or things for two. Included pieces: Two lounge chairs, one loveseat, two ottomans, a coffee table, four pillows. 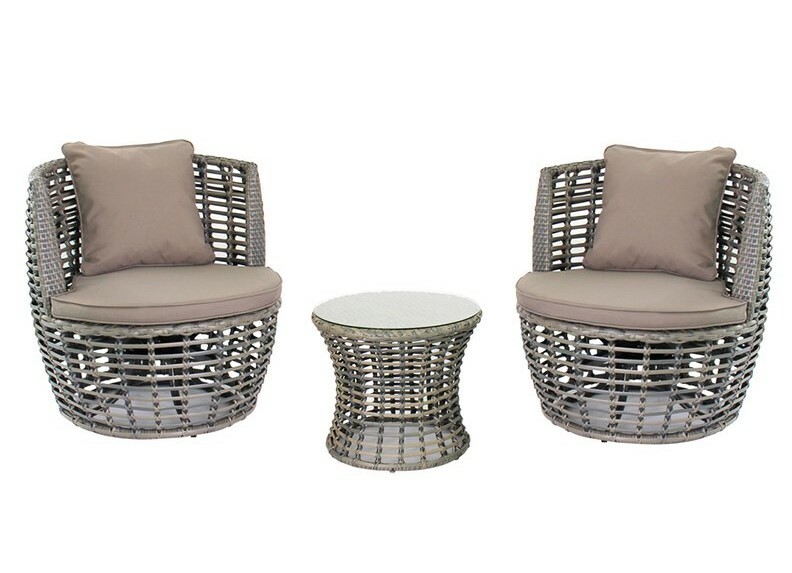 This resin wicker patio furniture is all-weather and is made of powder coated steel frame that is rust resistant. The table comes with shelves and has glass on top. The cushions are made of durable fabric that lets it last really long. The table has shelves and has inset glass. The assembly isn’t very difficult since there is just a bit of assembly required. The sofas are circular, a change from how most sofas or couches look. The table is circular too. Note that it is strictly for two people. The resin used is woven which makes it look attractive. 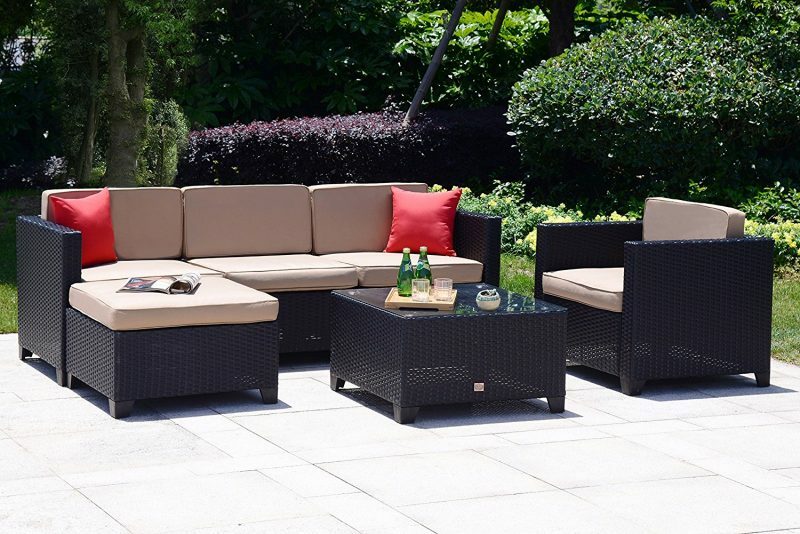 The cushions are all-weather, fade and UV resistant. Cleaning is easy- using a dry cloth. The table has a standard sized umbrella hole that lets you sit out even if there is a light drizzle. Assembly is required. The back of the chairs as well as the table is mesh-designed. 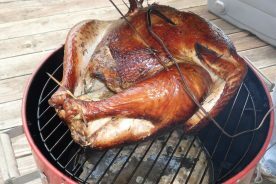 Since it is made of aluminum, it is rust resistant and all-weather. This can be used as dining table more efficiently and doesn’t come with cushions. So, to make it cozy and comfy, you will have to invest in cushions. The design is very simple. The seats are coated with sponge padded cushions. The whole furniture is resistant to rust and quite strong. The covers of the cushions are removable and the table has removable tempered glass. Assembly is required but is easy. This furniture comes with casual seat cushions. The chairs are stackable in case you decide to store them. The table is small and can only accommodate food or things for two people. Strictly meant for two people, it is compact. It is powder coated and has a durable paint finish. This set of five is made out of wrought iron. There is an added long-lasting finish because of electro-pherisis coating. There are no cushions and you will have to buy cushions and even seat cushions to make seating comfortable enough. The chairs and the table have designs and patterns. The table has an umbrella hole. The chairs are very sturdy and can endure a lot of weight. Any furniture- be it wood, plastic, resin, wicker, or metal, can be made to last longer if taken care of properly. If it is a wood furniture, make sure you paint a layer of varnish so that you save it from termites. 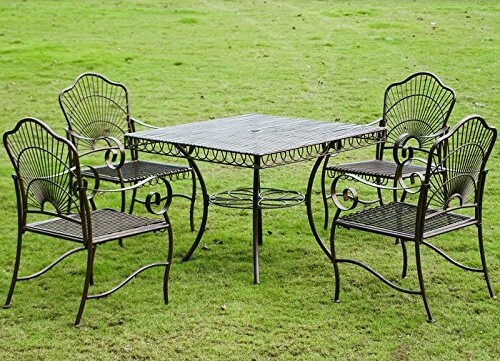 If it is a metal furniture and isn’t rust proof, take proper measures to protect it from rust. Buying the kind of patio furniture, and the budget totally depends on your frequency of use. When you buy accessories for your patio furniture, make sure they justify the fact that you are going to expose them to climatic variations. Cushions, covers, and table cloths should be all-weather and fade resistant. Especially, the cushions should be water proof in case of rains. Generally, if you keep your furniture clean and do it on a regular basis, you won’t be dealing with painful scrubbing. So, make it a habit to dust it off periodically and wiping off stains instantly. When you decide to travel and your house has no one for long period of time, consider covering your furniture, if not storing it. It would be better for you to choose a design that aligns great with your hall, in case you decide to move it indoors. So, try coordinating the color and buying furniture that goes well with your living-room walls as well as the patio. It is again a matter of purpose whether you go for a dining set or a more casual one. If you have a habit of dining in your patio, dining tables are all welcome. But, if you don’t, it is best to go for comfortable sofa kind of designs. If you are still wondering what’s the need of investing in patio furniture, there are enough reasons. Most of the times, people are too lazy to go out to breathe fresh air and instead choose to be the couch potato. Why not do both? Breathing fresh air and deriving enough vitamin-D from sunlight is really important. When you get patio furniture, you are relaxing as well as giving your lungs the amount of fresh air it deserves to get. So, go ahead and buy the best patio furniture for your patio and find the best place to spend your time with family and loved ones. There’s nothing as good as connecting with nature as well as family at the same time. Moreover, you don’t have to go on a costly vacation. Instead, you can create your own de-stress corner in your home to disconnect from the electronic world and spend time relaxing and re-energizing.